Chickens were coming home to roost for Walter White in the latest episode of Breaking Bad, and he was the one ending up in the fryer. With “Crawl Space” no matter what the doomed chemist did, he couldn't escape the fate he's been fearing since even before he saw what Gustavo can do with a box cutter. Powerful doesn't begin to describe the performance we received from Bryan Cranston as he portrayed the meltdown that has been building for more than a season and that can only be described as nuclear. Though the threat from below the border has been neutralized, the headsman's ax was still looming over Walt's neck, and closer than ever to striking. Far from Heisenberg, the Walter White we see in “Crawl Space” was much more like the man we met when the series first began. If he's not being pushed around, he's being prodded – literally. Recalling his time working at the car wash, he is forced to demean himself with physical labor, despite his position as a master meth cook(chemistry teacher). On his part, Tyrus slides right into his role as the new Bogdan, the man holding the whip that Walt can't escape. But if it was only the indignities of days past that Walt had to endure, than he would have counted himself lucky. Bruised from his brawl with Jesse, battered from his self inflicted car wreck, and thoroughly defeated by Gus. Left without a card to play -even if he really knew how- Walt ending up with a bag over his head in the middle of the desert definitely wasn't out of the realm of possibilities. Through equal measures of ego and necessity he has ruined his chances of working with Gustavo; a man who once respected Walt because he was working for his family not for himself. 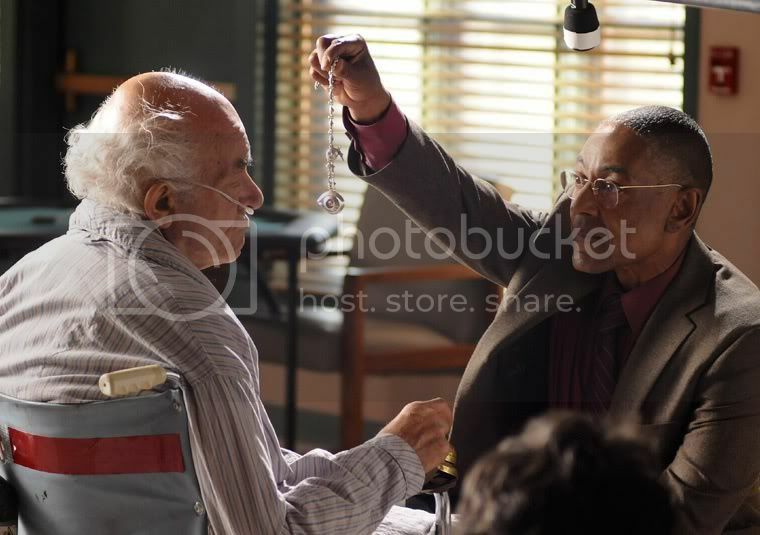 There was no way of knowing at the time, but perhaps when Gus heard Walt's story he saw another man who would do anything for his family, as Gus has done to avenge the friend he certainly considered family. But now there can be no understanding or empathy from Gus, as both men know exactly how they ended up staring each other down outside of Albuquerque. Skyler's fate was far less foreseeable than Walt's, as was the cataclysmic impact it would have on her ex-husband. Nonetheless, one of her own fears came true as the situation with Ted crumbled into chaos. All season long Skyler has been trying to prove she knows best how to handle Walt's illegal income, but with Ted's untimely encounter with a kitchen cabinet, all those lectures she gave came back to haunt her. Paying off back taxes to avoid an audit may seem less frivolous than buying Jr. a sports car, but if Skyler had listened to Saul's warnings she would have known that burning the money would have been just as effective. And after telling Walt they have to maintain full disclosure with each other, she is the one caught keeping secrets. Before we knew just what effect the missing money would have, the plot actually served to inject some much needed comic relief in the otherwise gravely dramatic episode. Huell and Kuby(who previously assisted Skyler in getting Bogdan to sell) are the kind of comedic duo that could score laughs from their polar opposite appearances alone. Kuby's easygoing demeanor played well off of Huell's intimidating stoicism; which made his partner's threats about keeping him happy all the more humorous. Though there is something to be said about being too passive. Maybe work on that reaction time instead of perusing magazines. What laughter there was couldn't replace the dread building with nearly every scene though. Witnessing along with Jesse what twenty years of pain and anger has turned Gustavo into was an effective way to remind us of the monster we were introduced to when the season began. Gus needs to see the pain in Tio that comes with each name listed, needs to showoff Jesse as the means with which he cut out the final ounce in his pound of flesh. It is closure as anyone might seek, but goes far beyond what anyone would see as reasonable. Even Gustavo's pragmatism has its limits. And now with the the final act in the Chicken Man's revenge play complete, his focus has nowhere to shift but the fly in the ointment. His replacement cook may not be fully willing, but Jesse being able is all Gus cares about right now. Jesse won't stand by and let Gus kill Walt, but after the literal beating their relationship has taken this season, his conviction is thin at best. As Walt comes frantically seeking Jesse's aid after realizing he can cook without him, he recalls the times that Jesse interrupted Walt's moments with his family. All season the two have been shifting roles, with Walt coming to rely on Jesse to save his skin as he had done so often for his one-time protégé. 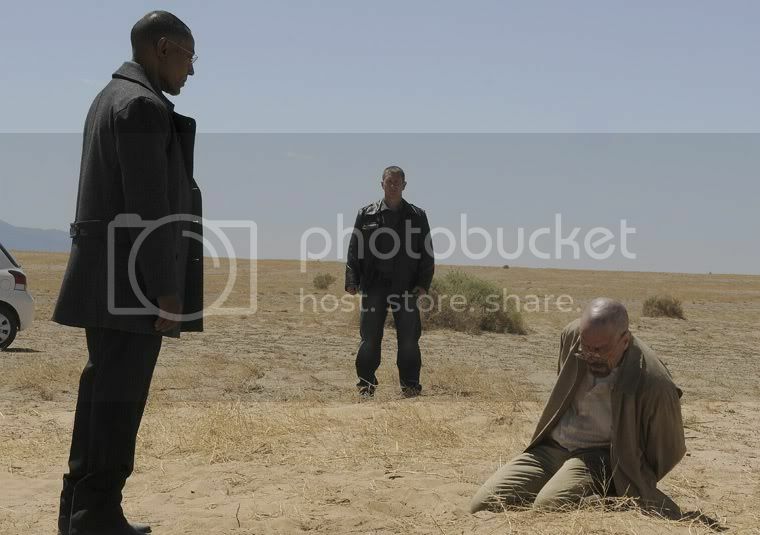 But after their brawl, and after Jesse too has realized he doesn't need Walt, the most he will do is refuse to cook for Gus if he is murdered; which his own pride keeps him from divulging. Once he is spurned by the only ally he has, is unable to draw on the strength and will that fuel his alter ego, and now sure that his family will pay the price for his sins, Walt's instinct to flee comes as natural as breathing. It is in this adrenaline surging state that both Cranston and the show itself find one their finest moments. Realizing before Walt does that the money he was counting on is currently in transit to the IRS didn't take anything away from the reaction it brought on. His cry of anguish at knowing his family's lives are now forfeit carried with it all the frustration and misery that has been building in Walt these last eleven episodes. Though the mad cackling that followed chilled the spine, it was with the final image that the scene truly left its mark. The crawl space opening framing Walt so much like the view of a man in a coffin, and Walt looking like you might expect a drug kingpin to appear in his final moments; surrounded by the ill-gotten gains that weren't enough to save him. If there was ever a time when Heisenberg was needed, it would be now, when Walt seems like he's dead already. After an episode so gripping, it's hard to believe there are still two left in Breaking Bad's fourth season. “Crawl Space” combined stellar acting performances with a well-written plot bringing two storylines together explosively. As this season nears the climax its episodes are only getting better, the latest of which promises that trend will continue.